On Thursday September 26th, two days before the arrest of leaders of the Golden Dawn (Χρυσή Αυγή), His Eminence Metropolitan Hierotheos of Nafpaktos and Agiou Vlasiou was asked by reporters of various newspapers in Athens to make a statement on the issue of the Golden Dawn. His Eminence responded and sent a separate statement for each paper. We publish below the statements in their entirety in the order requested. The Church is an open spiritual communion, it does not politicize, and her members vote in and belong to every party. It is not easy to determine who belongs to the various parties, nor should we try to do something like that. The Golden Dawn, in my opinion, took a percentage of votes in the recent parliamentary elections due to the economic crisis and the reaction of citizens to the political system that created the financial crisis. But because they had nationalism as an emblem, this is why, I think, they drafted some Christians, clergy and laity, who love their homeland. Personally as a person and clergyman possessed by democratic principles, I do not agree with fanaticism, nationalism and parastatal attitudes from wherever they may come. Very early I formed an opinion on the Golden Dawn, because I read various published texts and analyzed the use of its name and its ideology. That's why at times I made ​​statements and wrote texts against fascism, Nazism and nationalism. I think this was the reason that members of the Golden Dawn tried to interfere. From what I know, I'm the only Metropolitan that a Congressman of the Golden Dawn asked questions in the House in support of a Monastery in my jurisdiction responsible for several illegalities and delivering slander and unjust accusations against me. Fortunately he was confronted by the Minister of Education Mr. Arvanitopoulos. Also, recently Congressmen of the Golden Dawn attended an event at the above mentioned Monastery, although this particular Monastery is involved in serious cases of tax evasion, as well as illegal subsidy for which the State has decided for a return. It seems that there is a relationship between the Golden Dawn and the monks of this former Sacred Monastery, which raises serious concerns. I think Christians should take a negative position against any organization with a paramilitary mentality that is allegedly responsible for extortion and crimes. I think that the democratic State has mechanisms to enforce the legitimacy of a crack down on crime and to protect the freedom of expression and action of citizens and their safety, as well as to preserve the democratic polity of the country. The theology and practice of the Orthodox Church is not compatible with organizations that work with fascist, Nazi and nationalist attitudes and are allegedly responsible in violence, crime and paramilitary actions. I have stated this repeatedly and wrote about it in my texts. Because I am up-to-date in the news, I read in the past some serious studies that were the result of research by journalists concerning the meaning of the name Golden Dawn and where it comes from and what is its purpose. I think the clergy and laity who accept the Golden Dawn are misinformed and influenced by external events. 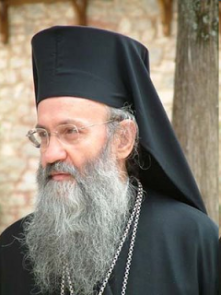 As the Metropolitan of Nafpaktos I have experience in this matter, because a Congressman of the Golden Dawn, apparently to insult me ​, asked questions in the House with libelous content, supporting a Monastery of my Metropolis responsible for illegal actions. Also, Congressmen of the Golden Dawn attended an event of that Monastery. It is obvious that we cannot accept actions which affect people's freedom, deny basic principles of the Orthodox Church, and is associated with the catalysis or undermining of democracy, even if some politicians have made mistakes. Christianity, particularly the Orthodox Church, has nothing to do with Nazism and its mindset, which is associated with violence, crime, dictatorship, racism and a breach of human and humanitarian principles. All this occurred in Germany before the Second World War and caused havoc and destruction to humanity and in our country. Much has been written about this issue. A year ago a study made by a ​​reporter made an impression on me, in which reference is made to the book of Louis Powell and Jacques Berzie titled The Courtyard of the Magi, which describes the mysticism of Nazism and Hitler's relationship with the mystical organization "Golden Dawn". Reference is also made to the poem titled "Golden Dawn", which is in the collection of poems by Paterakis titled The Glittering Darkness of Lucifer and is in fact a hymn to Satan. How can we reconcile all this with the truth that Jesus teaches? Beyond these things, Christianity cannot be associated with organizations acting violently and participate in events that are undemocratic and undermine the democratic polity of the country. I believe that if there are Christians who support such systems or do it out of ignorance, after so many revelations they are not justified, or they do so in violation of the principles of the Gospel. Source: Ekklesiastiki Paremvasi, "Δηλώσεις γιά τήν Χρυσή Αυγή", September 2013. Translated by John Sanidopoulos.